OKLAHOMA CITY – Cimarron County has more than twice the land owned by the Commissioners of the Land Office than any other county in Oklahoma, participants noted in a legislative study today. A large portion of that approximately 225,000 acres provides funding for several of Oklahoma’s higher education institutions, according to Secretary of the Commissioners of the Land Office Harry Birdwell. There is a total of 236,000 acres in land owned by the state in Cimarron County, according to county officials. State Rep. Casey Murdock said he requested the study to provide his colleagues with insight into how that land lowers the amount of ad valorem taxes available to Cimarron County and its school districts. There is also a significant negative impact on the local millage rate and bonding capacities of the school districts and county. It is unlikely that the Commissioners for Land Office could simply remit the money lost, because of laws regarding how they operate their trusts. Other states have dealt with the issue though. Although the Commissioners of Land Office provides revenues for schools and higher education, not all institutions receive funds equally, according to Birdwell. The agency owns 224,993 acres, of which 62,801 acres are set aside for school districts. 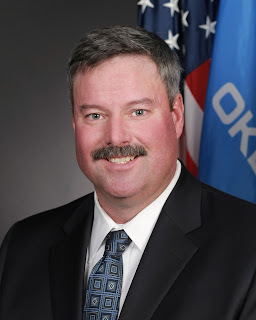 OKLAHOMA CITY –State Rep. Mark McCullough (R-Sapulpa, District 30) announced his intention to not seek re-election in 2016 and to retire from the House of Representatives after serving out the remainder of his current term. District 30 includes the communities of Sapulpa, Glenpool, Kiefer, Mounds, Liberty, Oak Ridge and Bixby. “It has been the honor of a lifetime to represent the area where I grew up and where my family is from. I am very humbled that my friends and neighbors saw fit to allow me to serve them in the Legislature these ten years. I am grateful.” McCullough said. McCullough entered the Legislature in 2006, winning a highly competitive election, and again in 2008 in another very competitive election year. He faced token opposition in 2010 and ran unopposed in the last two elections. McCullough has been in solo law practice in Sapulpa for nine years where he focuses on Probate and Estate Planning. He is assisted in his practice by his highly effective legal secretary, office manager, and wife of 17 years, Charlotte McCullough. His son Everett is in sixth grade at Sapulpa Middle School and his son Clayton is in fourth grade at Freedom Elementary. While in the Legislature, Rep. McCullough was involved in several major policy initiatives including pension reform, lawsuit reform, criminal justice reform, improvements in Medicaid and perhaps most significantly, worker’s compensation reform. McCullough was an early – and sometimes lonely – voice in the Legislature for comprehensive worker’s compensation reform, ultimately being asked to serve on the House legislative team responsible for writing and guiding the final reform bill through in 2013. 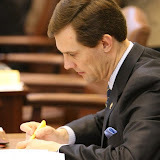 In addition to policy work, McCullough has also served as Chairman of Judiciary Appropriations and Budget Committee for the last several years where he is responsible for evaluating and meeting the budget needs for several state entities including the Courts, the District Attorneys and the Attorney General’s office. He also serves on the full Appropriations and Budget Committee, and as such is on the Budget Team, where he has focused the bulk of his time and efforts in the Legislature the last few years. McCullough held numerous studies on this issue of family fragmentation and its negative effects on society, its costs to government and how to prevent it. He also held press conferences raising awareness of the issue and ran several bills aimed at chipping away at the problem. One major success came two years ago when, working with Rep. Jason Nelson and many others, a bill passed bringing the first substantive change in Oklahoma’s divorce laws since the late 1950s. The bill required a statewide, pre-divorce class that included topics such as substance abuse, co-parenting, domestic violence and potential reconciliation. The bill was based on Tulsa District Court’s highly successful model. OKLAHOMA CITY – Governor Mary Fallin today announced she has named Tom Bates, who was a longtime assistant in the Oklahoma attorney general’s office, as her special adviser on child welfare and Pinnacle Plan implementation. Bates served 15 years in the attorney general’s office, mostly recently from 2012-14 as first assistant to Attorney General Scott Pruitt. His responsibilities included overseeing the more than 90 civil and criminal attorneys and 40 agents employed by the attorney general's office. As the governor’s special adviser, Bates will primarily be responsible for overseeing implementation of the Pinnacle Plan, the Oklahoma Department of Human Services’ (DHS) ongoing effort to reform the state's child welfare operations. Bates joined the attorney general's office in 1999. While there, he litigated and prosecuted a number of high profile cases. He served the office as Don't Call Registry administrator, lead assistant attorney general for consumer protection litigation, chief of the multicounty grand jury unit, chief of the public protection unit, and as first assistant. "Having worked with Tom in his previous capacity in the attorney general's office, I am excited that he will be working with us on the Pinnacle Plan,” said DHS Director Ed Lake. “We appreciate Governor Fallin selecting high-quality appointments to fill the role of special adviser and we know Tom will bring valuable perspective and experience to our efforts." A native Oklahoman, Bates graduated from U.S. Grant High School in Oklahoma City, and earned a bachelor’s degree and his juris doctorate from Oklahoma City University. Bates is an active member of Putnam City United Methodist Church and has served the congregation in a variety of leadership roles. He is a graduate of Leadership Bethany and has served on the board of directors for the Bethany Chamber of Commerce. He is also a graduate of the Oklahoma Bar Association's leadership academy and Leadership Oklahoma Class 28. He and his wife, Kellye, have been married for 26 years. They have two sons, Andy and Billy, who are both students at the University of Central Oklahoma. The Oklahoma Pinnacle Plan is a five-year improvement plan for the state’s foster care system. The plan was developed in 2012 as a result of a settlement agreement in a class-action, civil rights lawsuit. DHS agreed to make improvements in several key areas of the foster care system including increasing the recruitment of foster homes, reducing the use of emergency shelters, and lowering workloads for child welfare specialists. In recent months, DHS has announced the closing of its two state-run emergency children’s shelters, child welfare workers have greatly reduced the number of backlog cases, and the department and its contract foster care agencies have recruited hundreds of new foster homes. DHS has increased in-home services to families in an effort to keep children out of state custody and worked to help children reunite with their families or reach adoption faster. Thanks to these efforts, the numbers of children in care has been steadily dropping which is positively impacting all the goals in the Pinnacle Plan. OKLAHOMA CITY –The House Common Education Committee will hold an interim study this week on privacy issues related to student data. The study will be held on Wednesday, October 7, 2015, from 9:00 a.m. to noon in room 412C of the state Capitol. The study will explore the competing interests surrounding the collection and use of student information in public schools. The study will provide a broad overview of the many areas of consideration as the Legislature seeks to strike an appropriate balance between the need for student data for legitimate educational purposes and the need to protect student privacy through responsible limits on the nature and use of student information. "This interim study is only the beginning of a thoughtful effort to draft important student privacy legislation for consideration during the next legislative session," said state Rep. Jason Nelson, R-Oklahoma City, who requested the interim study. "From now through next session while work on this legislation continues I will be meeting with organizations and individuals interested in this issue. It is important that all sides are heard." The interim study is open to the public. The study will be streamed live through the Oklahoma House of Representatives website,www.okhouse.gov. A link to a recording of the study will be posted on the website later in the day after the conclusion of the study. Domestic violence affects one in four women. Sadly, Oklahoma is ranked sixth in the nation in the number of women murdered by men. This epidemic affects people of all demographics and communities, extending from the home to the workplace. Statistics like these are why the state of Oklahoma and Verizon have participated in raising awareness on these issues year after year in conjunction with Domestic Violence Awareness Month. Oklahoma recently dropped from third to sixth in the national ranking, but domestic violence is still prevalent. Employers, including both the state of Oklahoma and Verizon, have a very real stake in protecting their employees from this scourge. The Center for Disease Control and Prevention estimates the annual cost of lost productivity in the workplace from domestic violence at more than $7 million. More than 74 percent of employed battered women were harassed by their partner while at work. The side effects of domestic violence in the workplace alone translate to 8 million days of paid work lost each year. Everyone can help change the current path of domestic violence in the workplace by simply discussing domestic violence among coworkers, friends and family. Businesses should be encouraged to recognize signs of domestic violence, have programs in place or partner with an advocate agency for resources. The governor has named October “Domestic Violence Awareness” month in Oklahoma, and October 8 will be “Wear Purple Day” to raise awareness for domestic violence victims. All Oklahomans are invited to not only wear purple on that day, but to talk about the issue with friends and coworkers. For Verizon, preventing domestic violence is a cause that hits close to home. The company lost three employees this year due to domestic violence. It’s important that we have resources for victims. That is why Verizon created its HopeLine program long ago. HopeLine puts Verizon technology and its substantial wireless network resources to work in communities by collecting no-longer-used wireless phones and accessories, from any carrier, and repurposing them as a safe line for victims. Since HopeLine was founded in 2001, Verizon has distributed more than 190,000 phones with more than 543 million free wireless minutes and 298 million texts as a safe backup to victims of domestic violence. Additionally, Verizon has awarded more than $29 million in grants to domestic violence agencies and organizations throughout the country, several of which are here in Oklahoma. For the month of October, please consider participating in promoting awareness in your workplace by donating used cell phones and accessories to one of the multiple HopeLine drives. Contact your local district attorney or domestic violence agency to learn more about resources for victims or to view a screening of Telling Amy’s Story, a documentary that details the life of a Verizon employee who was killed as she tried to leave her abusive relationship. OKLAHOMA CITY – The House Business, Labor & Retirement Laws Committee today unanimously voted to send to the state actuary for review a plan to help reduce the impact of the national teacher shortage on Oklahoma classrooms. House Bill 1061, authored by Rep. Randy McDaniel, will allow school districts to pay up to $18,000 annually to teachers for the first 36 months after they begin collecting their retirement benefits. The current annual salary cap for retired teachers in Oklahoma is $15,000 for the first three years. House Republican leaders said they hope the additional $3,000 might allow recently retired teachers to return to the classroom or encourage other teachers who are considering retirement to keep teaching while receiving their retirement benefit and up to $18,000 in salary for three years. The Oklahoma Pension Legislation Actuarial Analysis Act (OPLAA) prohibits the Legislature from passing measures that increase the unfunded liabilities of the state’s public pension system. OPLAA requires an independent analysis of pension bills by the state’s contracted actuary. If the actuary determines that the legislation will increase liabilities, OPLAA requires the proposal to be concurrently funded with additional resources, instead of raiding the principal of the retirement funds as had been done prior to 2004 when Republicans gained a majority in the Oklahoma House. After 36 months, there is no cap on what a retired educator can be paid while also receiving pension earnings. The state-contracted actuary must now review HB1061 to determine if it will increase liabilities to the Oklahoma Teachers Retirement System (OTRS). Under the proposal, in order to offset the negative fiscal impact to OTRS of raising the cap by $3,000, the employer contribution rate would be increased from 9.5 percent to 11 percent for retirees who are rehired. The committee also approved an amendment today to the measure that would include higher education employees in the actuarial study. The return-to-work issue was a major point of discussion last session and numerous bills were filed on the topic. Most of those differently designed bills either greatly increased the income cap or removed the cap altogether, but McDaniel said they were not considered by his committee because of their adverse fiscal impact to the retirement system for Oklahoma’s teachers. McDaniel said the actuary should have his review completed by the end of the year, allowing the Legislature time to consider the bill during the 2016 legislative session. OKLAHOMA CITY – Oklahoma House Speaker Jeff Hickman appointed Rep. Charles McCall to serve as the chairman of the House Appropriations & Budget Subcommittee on Revenue and Taxation. Rep. McCall previously served as vice-chairman of the subcommittee under late Rep. David Dank, who passed away in April. McCall has a strong background in banking and finance, currently serving as CEO and Board Chairman of AmeriState Bank in Atoka. McCall also currently serves as a member of the House Appropriations & Budget Standing Committee, the Banking & Financial Services Committee and the Economic Development, Commerce & Real Estate Committee. OKLAHOMA CITY (Aug. 27, 2015) -- State Superintendent of Public Instruction Joy Hofmeister announced the fulfillment of two leadership positions today, the same day the Oklahoma State Board of Education approved the hiring of a new board attorney. David L. Kinney was named general counsel for the Oklahoma State Department of Education (OSDE), and Phil Bacharach advanced to chief of communications and public affairs for the OSDE. Brad Clark was named general counsel to the State Board of Education. Kinney takes over the position after serving 13 years as an assistant attorney general in the state’s general counsel section. There, he was responsible for advising boards and agencies on a wide variety of subjects, including open records, administrative procedures, contracts and personnel issues. In addition to representing the OSDE, he has also represented the Office of State Finance, the Oklahoma Lottery Commission and the Oklahoma Teachers Retirement System. Kinney spent 6 years as assistant general counsel for the Oklahoma Tax Commission. He holds a law degree from the University of Oklahoma, and is an Oklahoma certified public accountant. He grew up in Cashion and resides in Norman. Bacharach has served as the executive director of communications at the OSDE since 2013. The award-winning journalist has more than 25 years of experience in news, communications and public relations, including leadership positions at Oklahoma Gazette and KWTV Channel 9. In addition to serving as director of corporate communications for the Oklahoma City Thunder, Bacharach was deputy press secretary for Gov. Frank Keating and press secretary for his successor, Gov. Brad Henry. He is a graduate of the University of Oklahoma. Clark served as general counsel and director of legal services and policy at the Oklahoma Public School Resource Center (OPSRC) and previously dedicated nearly 5 years at the OSDE, working in the legal services division and as special assistant to then-state superintendent Sandy Garrett. While at OSDE, Clark focused on Oklahoma’s education policies, laws and regulations, and government contracting. Clark is originally from Oklahoma City and now resides in Midwest City. "The OPSRC team is extremely proud of Brad's accomplishments, and we look forward to continue collaborating with him through the OSDE," said Brent Bushey, OPSRC executive director. "I know Brad will use his talents to the benefit of both the OSDE and public education in Oklahoma as a whole." Clark received his law degree from Oklahoma City University. He is a board member for various local foundations and state boards, including the Muscular Dystrophy Association and Oklahoma Community Service Commission. An announcement last week by the Oklahoma Superintendent of Public Instruction of a new state program to spend $1.5 million for all 11th grade students to take the ACT exam while new state education standards are still in development and when the state faces a potential budget shortage as low oil prices impact the Oklahoma economy met questions from many House Republican legislators. Approximately 75 percent of Oklahoma high school students already register on their own to take the ACT before graduation and ACT offers financial assistance to students who may not be able to afford the roughly $40 cost for the exam. Lawmakers now have more questions about why that $1.5 million would be directed to start a new state program when it could be used as an incentive to help with the impact of the national teacher shortage on Oklahoma schools. House legislative leaders also expressed their desire to develop a long-term solution to teacher compensation in Oklahoma by looking at reallocating the billions of dollars the state now spends on public schools. Despite the false rhetoric of political education groups recently claiming Oklahoma schools faced greater cuts than other states, revenue for Oklahoma’s pre-K through 12th grade schools was greater than ever for the 2013-14 school year, almost $5.5 billion dollars. Examining expenditures and reprioritizing how the taxpayers’ dollars are spent by school districts could be the quickest way to boost classroom teacher salaries in Oklahoma. “Only in the past week did legislators learn of the state superintendent’s plan to spend $1.5 million on a new program to pay for all 11th grade students to take the ACT test. I and many members of the House of Representatives have expressed numerous times that the first priority must be the completion of new academic standards for our schools and submission of those new standards to the Legislature as soon as possible. Adoption of our new academic standards should be the starting point to the discussion and future decisions on state testing, not the other way around. “Last session, the House developed House Bill 2088 which would have reduced state-mandated tests and protected the standards development process by ensuring adoption of certain standards before making any further testing decisions. This position has not changed. This new state program announced today takes another instruction day for testing and adds another test, which is contrary to the direction we hoped to take with House Bill 2088. “I’ve always believed that financial savings could be found within existing education programs. That Superintendent Hofmeister has identified a surplus of $1.5 million proves this. But how she proposes to spend this extra money signals a shift in her priorities and a lack of appreciation for the looming revenue challenges the state is likely going to face next year. “There are important existing programs like the Reading Sufficiency Act where this money could be better spent. School districts have been requesting more money to help cover the cost of reading programs to help ensure third graders can read well enough to be successful when entering the fourth grade. “To my knowledge, the State Department of Education never requested funds for a voluntary pilot program to pay for college entrance tests for high school students— many of whom may not even be planning to attend college. School districts may have more pressing needs where these limited resources could be better used to enhance student learning. “The most recent numbers I’m aware of show that seventy-five percent of Oklahoma high school students already take the ACT college entrance exam. Starting a new pilot program to do something that is largely already happening is not the highest priority facing education in Oklahoma. “That the Department was able to identify a surplus of $1.5 million with which to begin a new pilot program is surprising considering the state superintendent expressed ‘severe disappointment’ over the level of appropriations to education last session. “I certainly think, as a general rule, that education funds are best allocated through the state per pupil funding formula to follow students to their local school districts and student choice programs. If there are savings to be found in the state’s testing program it would seem to make sense to push that money to the students through the formula. “Everyone agrees that learning happens when students and teachers are engaged in the classroom. “There was a discussion during the last legislative session about replacing the current high school end of instruction exams, or EOIs, with the Iowa Basic or ACT exams but the decision was made to wait until the new standards for English language arts and math are adopted early next year. The new standards should be adopted before the State Department of Education establishes a new program on student testing. OKLAHOMA CITY (March 29, 2015) -- I was contacted this weekend by veteran Oklahoma teacher Teresa Turner about my post Friday, "School district coercing teacher attendance at political rally alleged." Turner identified herself as the teacher responsible for questioning the coercive actions of her school district that led state officials to issue statements that coercing teachers to attend Monday's political rally at the state Capitol is not legal. "I am a public school teacher in my 23rd year of teaching. Our superintendent had informed me that “The board of education made it clear that certified staff would attend the rally or take leave.” As a conservative Christian, I have a strong value system of right and wrong, and I felt that being coerced to attend the Education Rally on March 30th was neither right nor legal. "I strongly believe everyone has a right to their own opinion; however, I felt it was a violation of my First Amendment rights to be required to attend a rally that represents views that do not align with my personal beliefs or take a day of personal leave. As a result, I simply did what the administration and board of education wanted teachers to do – I contacted several legislators and expressed my concerns about the current state of education. "Senator Kyle Loveless asked Attorney General Scott Pruitt for an opinion on the matter, which resulted in the State Department of Education releasing their press release Friday afternoon. I greatly appreciate his help, along with that of AG Pruitt, Superintendent Joy Hofmeister, Senator John Ford, and Representatives Jason Murphy, John Bennett, Josh Cockroft, and many others too numerous to mention in this short statement. I also thank my husband, Russell, for his inspiration and unending support. "I feel sure that superintendents and schools across Oklahoma will realize that this was merely a legal question, and will not retaliate against any teacher who might hold a view that differs from theirs." OKLAHOMA CITY (March 27, 2015) — The Oklahoma State Department of Education (OSDE) took swift action today in response to a report that a single school district had incorrectly notified teachers they would receive professional development credit for attending an education rally at the State Capitol. State Superintendent of Public Instruction Joy Hofmeister said OSDE officials contacted the Cooperative Council for Oklahoma School Administration, the Oklahoma State School Boards Association and the school district in question to make it clear that no teacher can be coerced to attend the March 30 rally. In a March 27 letter to Hofmeister, state Attorney General Scott Pruitt wrote that his office had received inquiries about a district inaccurately telling teachers that their participation in the rally was mandated professional development. OKLAHOMA CITY – Governor Mary Fallin today announced that Natalie Shirley, president of Oklahoma State University-Oklahoma City (OSU-OKC), will be joining her Cabinet as secretary of education and workforce development. Shirley will begin serving on Monday, January 26. Shirley became president of OSU-OKC in 2011. She is the first female president in the OSU system. Prior to her role at OSU-OKC, Shirley served as Oklahoma secretary of commerce and tourism for former Governor Brad Henry. She also served as the executive director of the Department of Commerce, the state’s leading economic development agency. Shirley has also served as president of ICI Mutual, an insurance company. Fallin called Shirley a perfect fit for helping to achieve a goal outlined in the governor’s inaugural address: increasing educational attainment. “One of my top priorities going into 2015 is to increase educational attainment in Oklahoma,” said Fallin. “We know that the best way to help Oklahomans – especially those living in poverty – is to get them the skills they need for a good job. Similarly, the best way we can support our businesses and grow our economy is to produce a more educated workforce. Making that goal a reality will take a cooperative effort between Oklahoma public education and our business community. Shirley currently serves on the board of directors for the United Way of Central Oklahoma, SSM Health Care of Oklahoma, the Girl Scouts, the Greater Oklahoma City Chamber of Commerce, the Oklahoma City Convention and Visitors Bureau, BancFirst, the Oklahoma State Fair Board, AAA Oklahoma/South Dakota, as a trustee on the Jasmine Moran Children’s Museum and on the community development advisory council for the Federal Reserve Bank of Kansas City. Shirley received a bachelor’s degree from Oklahoma State University and a law degree from the University of Oklahoma. She and her husband, Russ Harrison, have six children. OKLAHOMA CITY – According to the Pew Charitable Trust, some critics of the years-long federal Food and Drug Administration drug approval process, with its requirement for multiple clinical trials, contend that it is much longer than it should be, thereby keeping some promising drugs from those who might benefit. Withholding drugs from the most gravely ill has fueled several states to pass so-called “right-to-try” legislation that would make these drugs available, without FDA approval, to terminally ill patients with no other option. 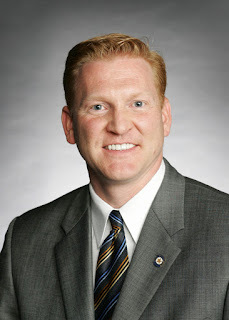 “The Goldwater Institute, a conservative non-profit that defends states’ rights, created model legislation in Colorado, and I have used that model to draft my legislation,” House Bill 1074, said state Rep. Richard Morrissette (D-Oklahoma City). Legislation in four states has now passed overwhelmingly with bipartisan support. All of the existing laws and the Morrissette proposal leave the decision to try an unapproved medication to the patient, the doctor and the drug company. In all participating states, the laws are supposed to open up access to drugs that passed through just the first stage of clinical trials and are part of ongoing trials. It has yet to be determined if ‘right-to-try’ legislation will withstand a legal challenge from the federal government. OKLAHOMA CITY – Oklahoma House Speaker Jeff Hickman announced additional leadership positions today, naming assistant majority leaders and assistant majority whips. The assistant majority leaders will work closely with Majority Leader Charles Ortega, who will be responsible for assigning bills to committees and determining the list of bills approved by committees, which will be available for consideration by the full House. They will also work with Floor Leaders Jason Nelson (R-Oklahoma City) and Lisa Billy (R-Lindsay) to develop the schedule for hearing bills on the House floor and directing floor activity during daily legislative sessions. The assistant majority whips will work with Majority Whip Gary Banz, who will be responsible for assisting the floor leaders and for ensuring that votes are in place and members are in attendance. The whips also serve as a communication system for the members. 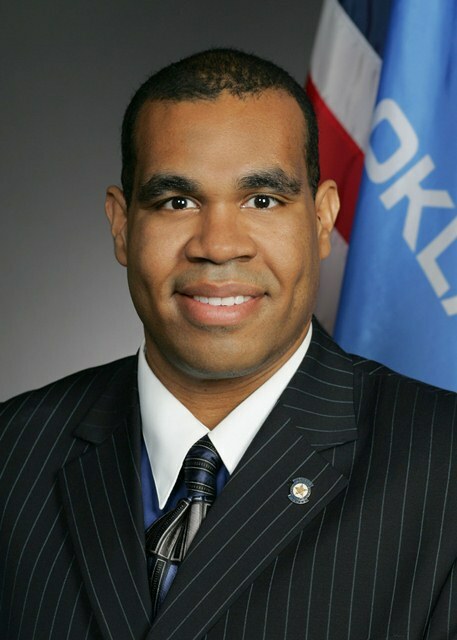 OKLAHOMA CITY (Jan. 8, 2015) - Today the Oklahoma Federation for Children, a state affiliate of the American Federation for Children, the nation’s voice for educational choice, is pleased to announce that former Democratic Oklahoma State Senator Jabar Shumate is joining the staff as Director of Legislative Affairs and State Director for Oklahoma. Shumate resigned from the Oklahoma Senate at the beginning of the year to take on promoting school choice policies in the state full-time. Since 2012, Shumate served as a Democratic Senator for Oklahoma’s 11th Senate District. He has been an advocate and champion for educational choice throughout his term, and has authored and introduced numerous education bills to the Oklahoma State Senate. Shumate’s legislative experience and keen political insight will be tremendous asset in Oklahoma and throughout the country. Featured at several national conferences, Shuamte is a sought-after speaker in the ed reform community who has addressed legislative leaders throughout the country about the need to break down barriers to educational choice. The Oklahoma Federation for Children is chaired by Bob Sullivan of Tulsa and Russell Perry of Oklahoma City. The OK Federation for Children works to increase the array and quality of K-12 educational options available to Oklahoma’s children. The Oklahoma Federation for Children is a state-based project of the American Federation for Children, the nation’s voice for educational choice. OKLAHOMA CITY – Today, the Oklahoma House of Representatives convened for Organizational Day and opened the First Session of the 55th Legislature by formally re-electing Rep. Jeffrey W. Hickman for a second term as speaker of the House. 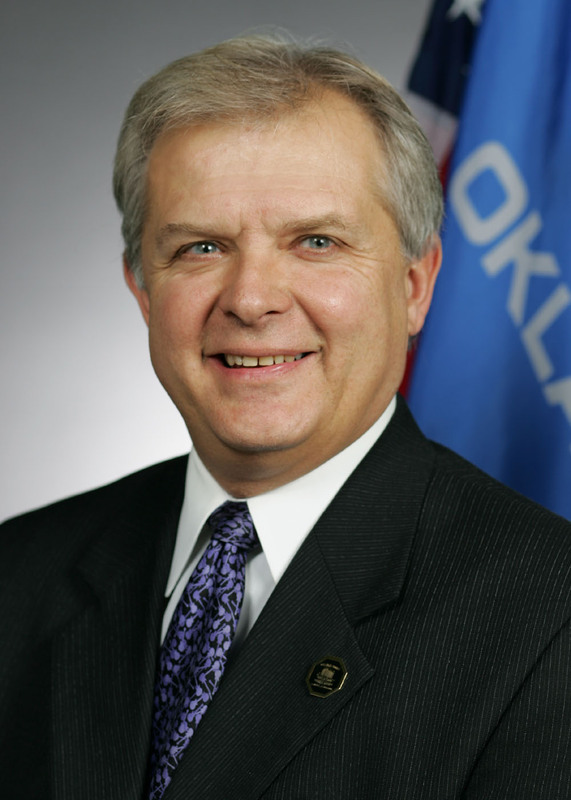 Hickman is the 43rd House member to serve as speaker since Oklahoma was granted statehood in 1907 and the seventh Republican speaker in state history. The House also took a full vote and elected Rep. Lee Denney to serve as speaker pro tempore. Denney is a veterinarian and has served as chair of the Appropriations and Budget Education Subcommittee for the past six years. She is the second woman in Oklahoma history to hold this office, both of which have been Republican. The House will reconvene on February 2nd at noon to continue the First Session of the 55th Oklahoma Legislature. OKLAHOMA CITY – Speaker Jeffrey W. Hickman announced House committee appointments for the 55th Legislature today. “Most of my professional career has been dedicated to serving the people of north Tulsa in the Oklahoma Legislature. It’s been an honor to represent the citizens of Senate District 11, and before that, the constituents of House District 73. “However, I was recently encouraged to pursue other opportunities that will allow me to continue to work to improve education and champion other issues I am passionate about. Gov. Mary Fallin today set the key dates for filling the vacant Senate seat. The candidate filing period for the Special Election to fill the Senate District 11 seat is January 19, 20 and 21. The Special Primary Election is set for April 7 and the Special General Election is set for June 9. In the event a Special Primary Election is not necessary the Special General Election will be held on April 7.